Ever since I was in early gradeschool, I have been fascinated by the night sky, and by astronomy. I had a telescope as a kid. I constantly stared at astronomy books and the beautiful photos of distant nebulae, read about the theories of the universe and solar system. This interest of mine has waxed and waned through my life. Though I am hardly an astronomer, I still stare dreamily up at the stars, much to the confusion of whatever other adults may be nearby. 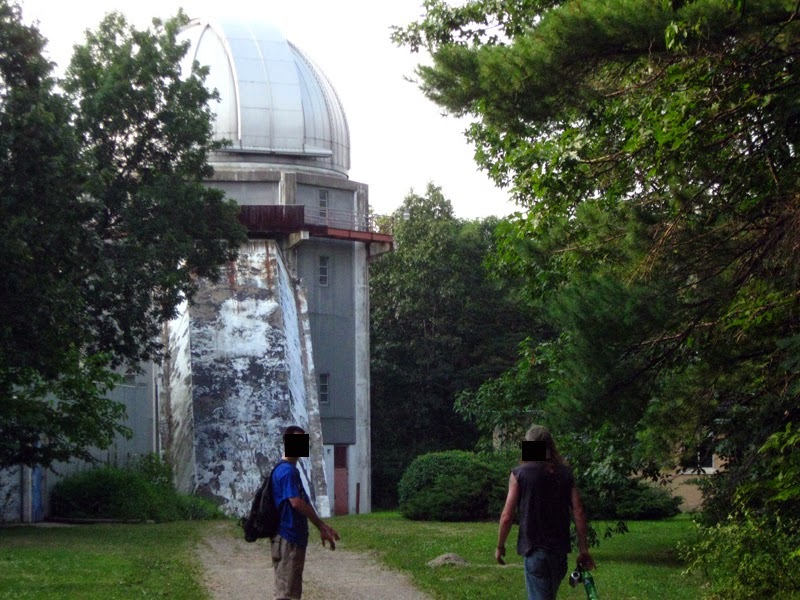 So when I was putzing around the internet one Friday night at 3am and found out that there was an **abandoned observatory** somewhere in southeast Michigan, I snapped to attention. Not only was there one abandoned-looking observatory, there were two on the same site. Of course, your mileage may vary on what you consider to be abandoned, but "disused" might be a better descriptor. The only info I had was that the location was on “Peach Mountain,” and situated somewhere outside Ann Arbor, being a former observatory used by University of Michigan. I paused only long enough to brew myself another hi-octane cup of insto-coffee before setting myself to the task of pinpointing the location of my newest Holy Grail. With the bit of intuition I had as a result of the knowledge I had of the Hulbert-McMath connection to Cranbrook astronomy, it was not long before I was staring at the gorgeous site on aerial imagery. From the looks of it I would have to do some hiking to reach this uber-nerdly location. It sat atop Peach Mountain, in the center of the Stinchfield Woods, a 780-acre forest preserve kept by the University of Michigan since 1925 for conservational and educational purposes not far from the town of Dexter, which lies northwest of Ann Arbor proper. This was far into rural Washtenaw County; it was a separate observatory from the one that Hulbert and McMath were involved with. However it turned out that the 24” McMath Memorial Telescope that was once housed in their Lake Angelus observatory had been moved and was now in use here at Peach Mountain; I found that Peach Mountain actually had two sites…just down the path from the abandoned observatories were a few more modern buildings, and some radio telescopes. It was in one of these modern buildings that the McMath Telescope now resides. By now the sun was dawning on me, and I rushed to gather supplies / make the necessary preparations for the next day’s mission. I ended up taking a nap for a few hours since I would need a partner on this mission, and I knew Crawly would not be awake for quite some time yet. Chad ended up joining the party as well, and we rolled out into the western countryside about midday. It took us about an hour to make the full journey by car, and when we arrived, I made a long slow circle of the entire Stinchfield Woods property. If you look at it on a map, it is just a huge parcel of forest, a stark contrast to the farmland surrounding it. As it turns out, Peach "Mountain" is not very tall…more like a steep hill. But I guess in the 1920s, when Detroit was still small and light pollution was almost non-existent, this little hill outside of Ann Arbor would have been considered as ideal a spot as you could put an observatory in Michigan…back then it was not a very simple matter to just hop on a flight to Chile or Alaska or any of the other far flung places in which modern observatories are now built. The access road going up the mountain to the two observatory sites was marked by this old stone gate, which had a heavy steel barricade across it preventing us from driving up. Oh well, I’d rather hoof it anyway. We began hiking and I rued the fact that I couldn't find my compass once I lost track of where north was…but Chad’s smartphone had a compass in it, much to my chagrin. From my studies of Google Earth beforehand, all we had to do was follow the simple directive of taking the two-track to the gravel pit, then heading directly north through the woods until we hit the access road on top of the mountain. This was easy enough, however once we broke into the woods we noticed that it was criss-crossed by a network of many small trails...which one was correct was left up to guesswork. We followed those for some time, heading in a generally northerly direction, until we finally came to a wider vehicle path that must be the Peach Mountain access road we sought. After about another mile of hiking, we came to a point where something loomed through the trees at us…a domed structure…. We had arrived at the observatory. Like a super-villain-hideout sort of place, where Mr. Freeze might take up residence while concocting his insidious plot to plunge Gotham into a deep freeze with his freeze ray, which he has conveniently set up inside this conveniently abandoned observatory. And then I guess he would rob banks…or, whatever Mr. Freeze does. The out of control grapevines were a nice touch too. Heber Doust Curtis became Chairman of the Department of Astronomy on October 1, 1930 and was charged with “developing a new site for an observatory and a new large telescope of world rank for astronomical research,” essentially putting the University of Michigan on the map, in the field of astronomy. He died in 1942, just before retirement, having accomplished almost nothing towards this goal despite full financial support. However, Judge Henry Hulbert had donated (on behalf of the McGregor Fund) a large piece of fine pyrex 2.5 meters in diameter for use in the construction of a reflecting telescope that Curtis had designed. By 1946, the McGregor Fund pointedly asked what U of M’s intentions were for the expensive glass element that Hulbert had donated. Hulbert, the secretary for the McGregor Fund and amateur astronomer himself, “expressed dissatisfaction” with the “imperceptible progress” of the preceding ten years, and demanded that the new telescope be started immediately, and that it be named in memoriam for Heber Doust Curtis. The U of M Board of Regents decided to return the 2.5 meter disk originally given by the McGregor Fund in 1935, with thanks and regrets that they could see no funds to pay the costs of an instrument of that size. McGregor Fund then agreed to contribute a total of $100,000 toward construction and equipment leading to the installation of a much smaller telescope of advanced design in the Stinchfield Woods, the telescope to be named The Heber Doust Curtis Memorial Telescope. We circled around this beautiful little gem, looking for any way in. The front door was tightly sealed, as was the bay door. Luckily I had the malice of forethought to bring the grappling hook that Drew bestowed upon me a few years ago, but so far I had never managed to successfully use. I chose this moment to suavely unveil it to my two unsuspecting comrades who then emitted sounds of much approval and amazement, before swiftly taking up their respective positions for recording this l33t and potentially disastrous event on camera. I was able to ascend the rope to the catwalk of the observatory where I saw a door that might let us in, plus ‘roof’ access. Well, the door was featureless and would not budge, but it was novel to be up here nonetheless, even if the catwalk was covered in piles of large buzzard turds. Knowing that there was power to this complex due to a porch light that had been left on at the residence-like structure nearby, I felt it might be unwise to force the issue. The grass was kept well cut here, and the structures were looked-after to some extent. I was a little saddened that the vintage observatory was a no-go, but I was for sure more determined to enter the taller, newer observatory up the hill. It looked as though if nothing else, I could scale the pitched backside of the tower and climb over the railing to access the catwalk there and have a look around. The view from that monster must be astounding, seeing as the catwalk stood about five stories off the ground, and the tower itself sits atop a hill 1000+ feet above sea level. The university's astronomy program is itself over 150 years old. This complex of mid-century buildings definitely had “scientific outpost” written all over it. I just hoped nobody showed up while we were here. I was surprised to find that there was a way in. Words could not express how impressed I was with this. I was actually inside a dark, dirty, cobwebby, abandoned observatory. And it wasn’t even my birthday. The echoes of our entry reverberated loudly and hollowly throughout this mostly open structure; above us soared a vast open space reaching up to almost the top level of the tower, and we could see the stairs going up, and windows letting in some light. The structure was mostly concrete construction, giving it a 1980s sci-fi movie set feeling. It is my hunch that the purpose of this angled part of the structure was related to solar observations, especially sunspots and coronal activity. If I recall correctly, these are not done with an optical telescope, but by projection through a tunnel onto a large flat surface, like a movie projector. However they were not; their insides were simple square rooms. We found a cabinet in one that contained all kinds of old medium format slides, sorted in drawers by subject. They mostly pertained to zoology, forestry, botany, etc., and I wondered if they were stored here because the Stinchfield Woods was maintained by the university’s Department of Forestry, who technically owned this property. We leafed through these for a moment, but didn't find anything particularly exciting. On a shelf I found a newspaper dated to 1976. Next flight of stairs brought us up into the dome housing, the main observation room. I was beside myself. I had a hard time getting proper photos of this space without a wide-angle lens, but I guess that's the price I pay for point & shoot portability. What future is there for an observatory in the second-cloudiest state in America, mere minutes from the light pollution of its 10th-largest metropolis, a mere thousand feet above sea level in this day and age? And now you know why it is abandoned. There were panels with switches, some marked “white lights” some marked “red lights”…the red ones are used during operations, so as to allow work in near darkness. We stepped out on the catwalk, and beheld the splendid vista…of tree branches. Looks like they could stand to do a little trimming around here, haha. So yeah, the place has been out of use for awhile. The view here is equivalent to or greater than that attainable from the Broderick Tower. We sat up here resting and enjoying the warm summer breeze for quite some time. It was very quiet and we could hear the sounds of weekend boaters cruising the lake in the distance, and the occasional rifle shots from a gun range somewhere. Otherwise it was just the peaceful sounds of the woods below. According to The University of Michigan, an Encyclopedic Survey, the U.S. Navy had a part in providing money for developing this site. At the end of the war in 1945 the armed forces began to offer grants and award contracts in support of astronomy and, somewhat later, similar allocations of government money began to be made by agencies created specifically for such tasks. The Office of Naval Research became one of the main supports for astronomical research nationally, and the Michigan Observatories and the Department of Astronomy moved rapidly to get money for their research programs. Important support, in amounts larger than any previously available, came from the Navy for studies in ultraviolet and infrared solar spectroscopy. On June 11, 1954, the Regents approved a proposed razing of the Observatory Residence, built in 1868. This continued a slow erosion of the Observatory properties in Ann Arbor that had begun early in the 1900s. By Regental decision the Department of Astronomy was required to vacate its offices, classrooms, and telescopes on the site that had been dedicated to astronomy for one hundred and ten years. Office and classroom space in a new Physics-Astronomy Building was allocated to the department, but the future for the Observatory created by Tappan in 1854 and extended by Hussey in 1905 became uncertain. In 1963 the department's astronomical observation was performed mostly at observatories remote from the campus; indeed, many research observations were being made from space vehicles in orbits around the Earth. The Heber Doust Curtis Observatory reopened for full-time research in May, 1963. It resumed its mission of measuring southern double stars. In 1966 efforts to relocate or replace the 0.95-meter telescope, still on its original location, had produced the beginning of construction of a new building in the Stinchfield Woods near the building for the Heber Doust Curtis Memorial Telescope. 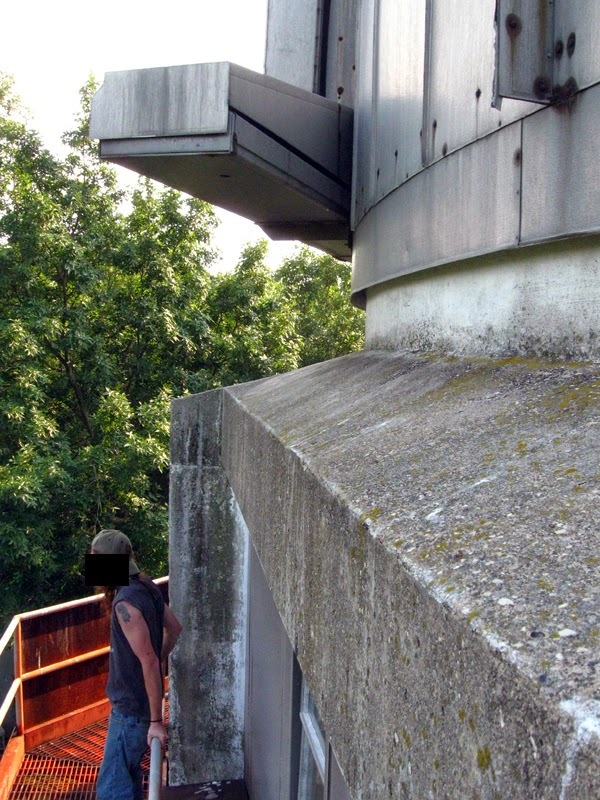 A new telescope, a reflector 1.3 meter in aperture eventually was commissioned in this new building in 1969. That would be referring to the second, taller observatory building here. These additions to the department were paid for from various sources. The University of Michigan paid most of the cost of the housing for the telescope, and most of the cost of the telescope was paid by a grant from the National Science Foundation. The Heber Doust Curtis Telescope was used extensively in the summer and early autumn of 1967, but in October 1967, this excellent instrument was moved from the Stinchfield Woods to the Cerro Tololo Inter-American Observatory, near Vicuna, Chile. The telescope was moved as part of a leaselend agreement between AURA, Inc., and the University of Michigan, whereby all the costs of moving the telescope, refurbishing it, and installing it in working condition in Chile were paid by AURA. The University of Michigan was assigned 122 nights observing time per year by the Cerro Tololo Observatory as the rental fee for the use of the telescope. Observing activities were definitely moving far from the University's campus. On March 9, 1967, an instrument designed and constructed within the University was placed in an orbit around the Earth on board NASA's Orbiting Solar Observatory, III. The McMath-Hulbert Observatory thus became the third astronomical observatory in the United States to make observations via satellite. The University of Michigan's Radio Astronomy Observatory had four instruments on orbiting space craft by the end of 1967. When the Portage Lake Observatory was first opened, another tract of land a half mile to the west had been reserved for the Astronomy Department. However it was not until 1955 that this land was used. First an 8.54 meter radio dish and subsequently a 26 meter radio dish were built. Eventually the 8.54 meter dish was turned off (it still exists at its original location, but has been unused for years). The control building for this dish is still in use, however it no longer controls a radio telescope. The 26 meter dish is still in use. The 8.54 meter dish is next to a small building (the dish and the building are shown in the photograph above). Originally the building was used to control the small dish and record data. The dish was decommissioned years ago, but the building has been used for a variety of purposes. The Department of Atmospheric, Oceanic and Space Sciences has used the building for research on aurora. The building is currently used by the Astronomy Department as a dark sky observatory for astronomy students (the building holds some telescopes which are used in the nearby field) and by the Physics Department to conduct measurements on night sky brightness levels (the building contains an all-sky camera which can make measurements once per second all night long). The night sky measurements may give information on light pollution which has been a steadily increasing problem even in locations such as Peach Mountain. We read a sign describing how the Office of Naval Research had funded these radio arrays in the 1950s. I noted how antiquated this smaller, disused dish looked, and that it resembled V’ger…you know, from the first Star Trek movie. By the way, the dome on this sucker is made of all copper.